/ Modified jul 24, 2018 11:32 a.m.
Ron Thompson, general manager of the Washington County Water Conservancy District, says southwestern Utah needs the Lake Powell Pipeline to meet the needs of a growing population. He said even the most ambitious conservation programs won’t provide enough water. This story is Part I of a five-part radio series on water conservation in collaboration with KUER, KUNC, KJZZ and the Mountain West News Bureau. A conservation ethic is growing in the nation’s second-driest state. The state requires all water districts to set conservation goals and incentives, like the rebates Kelly talked about, to encourage lower water use. But Utah is also pushing forward with a plan to tap more water from the Colorado River to serve two counties in the southwestern corner of the state. That raises a question: Does Utah really need so much water? VIEW LARGER Wyoming, Utah, Colorado and New Mexico are considered Upper Basin states in the 1922 Colorado River Compact that divvies up water. Tension has been increasing as the Upper Basin states consider capturing water that the Lower Basin states of California, Arizona and Nevada have been using for decades. For Ron Thompson, general manager of the Washington County Water Conservancy District, the answer is yes. “No matter how you say it, the water is the key ingredient to any quality of life we want to have,” he said. St. George is the center of the fastest-growing metropolitan area in the country in the driest part of Utah. It’s an oasis in red rock country where the Colorado Plateau, the Great Basin and the Mohave overlap. Its location and its popularity present a big challenge: how to keep growing with limited water. It’s a problem the Mormon pioneers who settled this area faced. For Thompson, working together on conservation now is important. But he’s said for more than a decade that conservation alone can’t support growth here, which is projected to swell from a population of 165,000 to 500,000 by 2060. That’s why Thompson has led efforts to build the Lake Powell Pipeline — basically a giant straw to draw Colorado River water over 140 miles of desert. The project would deliver enough water for around 99,000 households, more than triple the current number. It would cost over $1 billion. VIEW LARGER This map of the Lake Powell Pipeline project shows its 140-mile route over a mixture of federal, state, private and tribal lands. The Federal Energy Regulatory Commission is currently reviewing the state’s application to build the pipeline. Developers of the West’s big water projects like the Lake Powell Pipeline are sometimes called “water buffaloes.” But Thompson has his own take on the term. Pipeline critics see Utah’s water situation in a different light. They question whether the Utah lifestyle really requires so much water. Looking at the numbers, it’s a fair question. 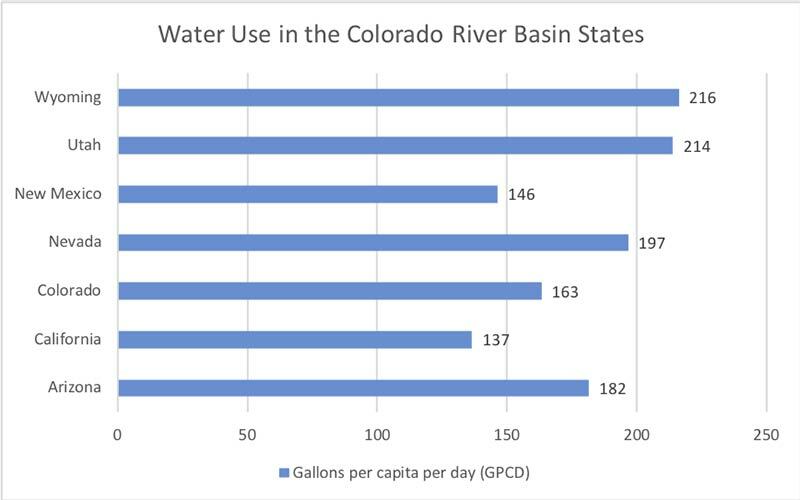 The average person in the seven Colorado River Basin states uses 164 gallons per day (GPCD). Meanwhile, the state of Utah’s GPCD is 214. According to Utah’s federal application for the Lake Powell Pipeline, the state is planning for a 325 GPCD in the St. George area. “The real elephant in the room is the price,” said Nick Schou, conservation director for the environmental group Utah Rivers Council. He said Utahns would consume less if utilities charged what water’s really worth. “We have the cheapest water that you'll find anywhere in the United States,” Schou said. VIEW LARGER St. George residents on average use 28,000 gallons of water during the month of July. This graph shows how different cities have different water pricing that environmental groups say is key to promoting conservation. 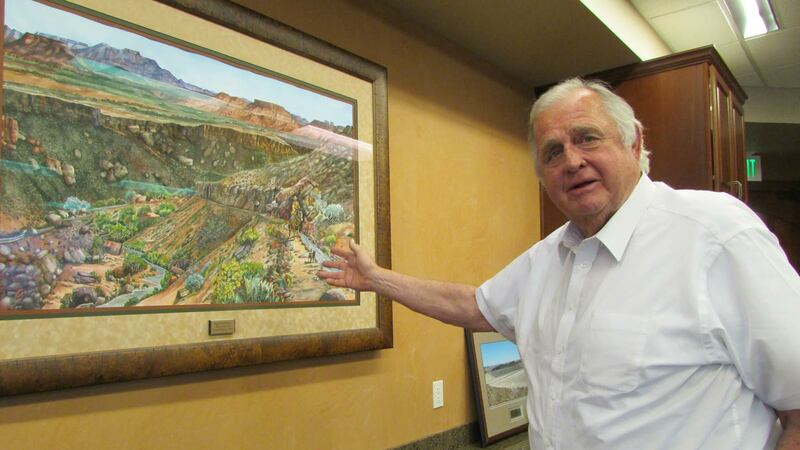 KUER tested Schou’s assertion by comparing a prices in the Colorado River Basin. 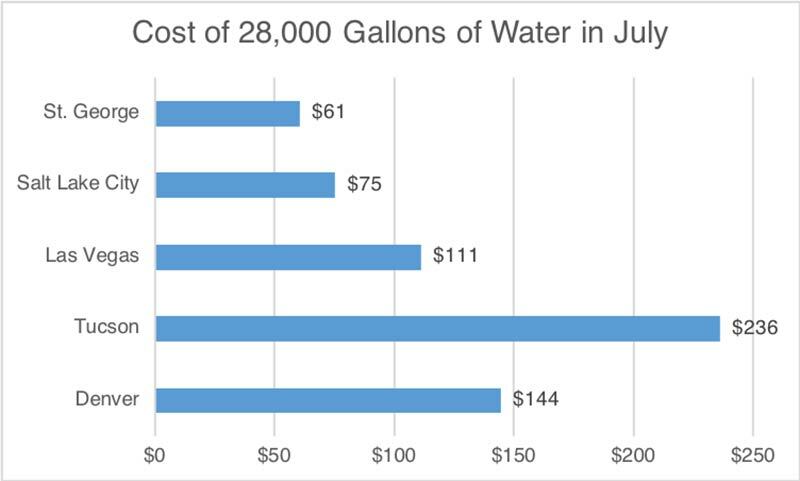 The question was: What’s the cost of 28,000 gallons of water, the average amount used by St. George residential customers in July? In nearby Las Vegas, the bill would be $111 dollars. In Denver, $144. And in Tucson, the one-month bill would be $235. The picture in Utah is dramatically different. Salt Lake City customers are paying $75 for those 28,000 gallons in the hottest month of the year. St. George water customers pay less than $61. Schou said Utah is decades behind in conservation. Roy Schell of De Beque Colorado said he’s looking for Utah to start doing better when it comes to protecting water resources. As a Coloradan, he depends on some of the same supplies as Utahns. 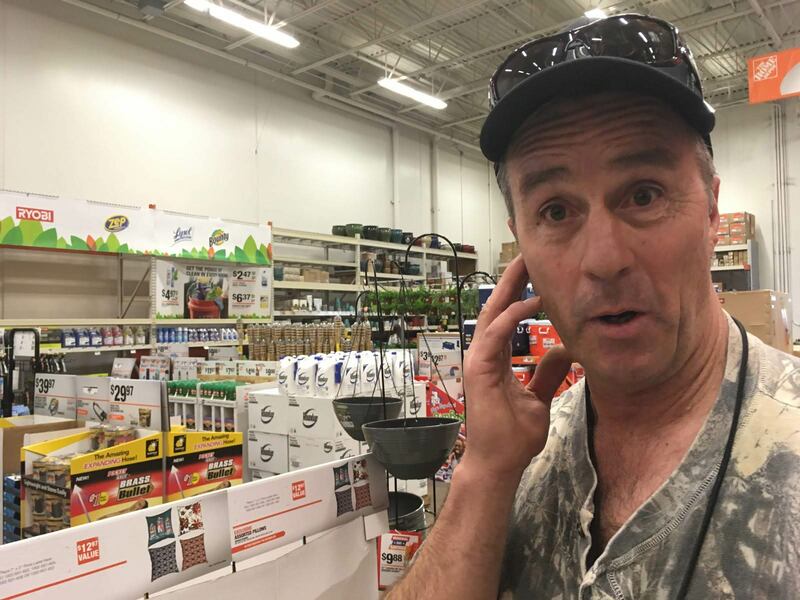 Back at the Home Depot in St. George, Roy Schell headed out of the garden section. He lives north of Grand Junction along the Colorado River and travels throughout Utah for job as a tech consultant. Schell said he’s surprised by all the turf he sees and all of the gushing sprinkler heads. “We don’t have enough water to not conserve,” said Schell. Schell said he and his wife watch their water bills closely. This year he’s watched the water levels drop especially low on the Colorado River, the resource residents of the seven Basin states rely on.